Apple yesterday announced a slew of changes to the App Store including an overhaul of subscription pricing policies, paid search ads, faster App Store review times, and more. Amongst the changes to subscription prices was one particular change that I think is really significant, but hasn't yet got much attention: territory pricing and more pricing tiers. Starting this fall, apps with auto-renewable subscriptions will be able to offer territory-specific prices and will have access to 200 price points across all currencies. You will be able to set the prices you think are suitable for subscribers in different markets, and you will have the flexibility to price your subscriptions at parity if they’re available elsewhere. A new iTunes Connect pricing tool will help you manage pricing based on current exchange rates. If there is a tax increase or currency adjustment in a particular region, the price of subscriptions will generally not be affected unless you decide to pass the adjustment on to your users. If you're interested in a detailed explanation of the current system of App Store Pricing Tiers, you can read this article I wrote last year. The short explanation is that when a developer sets a price in the App Store, they don't actually specify a price, but rather a pricing tier. So for example US$0.99 is Tier 1 and US$9.99 is Tier 10. Apple then does some currency conversions so that the price in local currency for each tier is roughly equivalent in every country. That's why an app in the US for $0.99 at Tier 1 and $1.29 in Australia. In the current system, developers cannot choose to sell their app at different price tiers – they must pick a single tier. Because every standard tier is converted to an equivalent currency value, apps essentially cost the same in every country. However, there is one exception to this rule. A few years ago, Apple introduced Alternate Tiers. 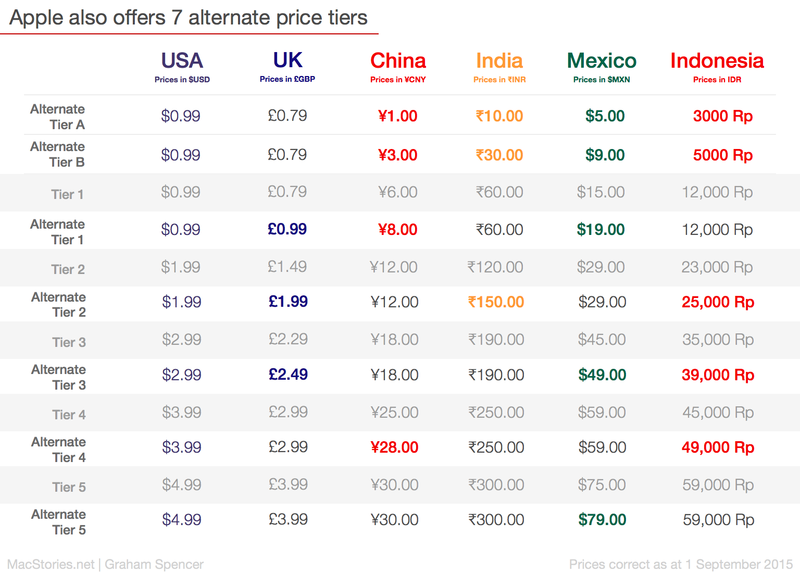 With these 7 Alternate Tiers, there is some difference in value between countries. For example, in Alternate Tier A, an app in the US will cost $0.99 but in China it will cost just ¥1 (~US$0.15). Most of the countries affected by the Alternate Tiers are developing countries, allowing developers to charge lower prices than would otherwise be possible. But it also includes some developed countries such as Australia so that the lowest price can be the very clean AUD$0.99, rather than the AUD$1.29 that is Tier 1. These pricing tiers apply to paid apps, In-App Purchases, and In-App Subscriptions. In total there are 87 standard pricing Tiers and 7 Alternate Tiers. Let's dive in a bit deeper on each of those three elements. There will also be new tiered pricing options for app subscriptions, up to 200 of them across different currencies and territories. This is something that could impact companies like Netflix, which offers one rate for streaming services in the US, but might want to lower the subscription price when launching in an emerging market. Many developers will be glad that they can now charge a lower price for their app in developing markets which may be more price-conscious than those in countries such as the United States. The Alternate Tiers in the current system does allow for this, but only in certain configurations and it was at Apple's control as to which countries received discounted prices and by how much. This new system will give developers complete control over pricing in each territory that the App Store operates in. I would encourage developers to be very cautious about engaging in price discrimination between two countries with similar purchasing power. I also wonder if Apple will implement any limits on the ability to set the pricing tier per country (though I think it is unlikely). The increase in the number of pricing tiers (more than doubling the number) is particularly interesting. The current tiers go up in US$1 increments from $0.99 to $49.99, after those first 50 tiers they start increasing in greater increments until it reaches $999.99. Given that it is unlikely Apple will allow developers to sell recurring subscriptions of hundreds of dollars, it seems likely the increments between tiers will be significantly reduced, allowing a greater degree of pricing options at the low-end. Tiers 176 - 200: Starting at $105, going up in increments of increasing size to $250. Alternatively, it could be more simply the case that the additional tiers are just inserted in between the current pricing tiers. Even just focusing on what is really just one paragraph on Apple's website, and a sentence or two in the press coverage of the broad App Store changes, it's clear that this could have a big impact on the economics of the App Store. Developers will soon be able to price discriminate based on a user's country. It's great for those developers who want to make their app/service more accessible around the world (and for those users), but not so great for those users who might be the subject of higher prices than users in another country of similar purchasing power. There are more price tiers, allowing developers to set a more specific price, and bridging what is currently perceived as a huge gap between $0.99, $1.99 and $2.99. And yet, it appears that these changes will be limited only to those apps which implement a recurring in-app subscription. This is an additional incentive on top of the fact that developers will get an 85% cut of revenue when a user renews their subscription into the second year and beyond. The impact of these new subscription pricing policies this Fall is going to be one to watch closely.